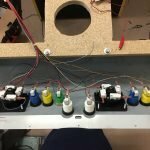 In the last post, I mentioned how to run AC to different components of an arcade. One of these components was the switcher. This runs off of AC voltages, but converts it to DC voltages. 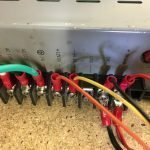 The DC voltages coming off of a switcher are usually +5 volts, -5 volts, +12 volts, and ground. These voltages can distributed by the harness. Most games after 1985 uses a standardized pinout called JAMMA (Japan Amusement Machine and Marketing Association). For any Printed Circuit Board (PCB), sometimes called motherboard or board, it needs at least +5 volts and ground. If the PCB can get these two things then the board should run. 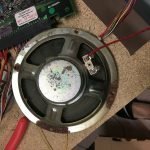 The +12 volts and -5 volts usually is used to run the audio section of the board. While not hooked up, would only produce no sound, but the game should still run. 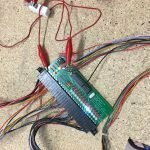 When testing a unknown game that’s not JAMMA, I will just use the +5 volts and ground along with the monitor outputs of red, green, blue, sync, and ground. This bare minimum will tell me if the game is running or not. The coin door lights might be the other item that runs off of the DC voltages. The lights can run off of +5 or +12 volts depending on the light bulb. 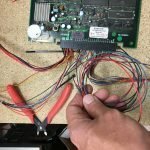 From the JAMMA harness, the wires will run to its corresponding part. 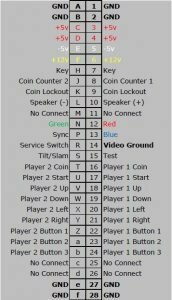 An example would be pinout 17 (Player 1 start) would then connect to the player one start button, but you also need a ground for the other side of the button. The ground wire is usually “daisy-chained”, which just means that it can go from button to button. This means you only need one ground wire run to the control panel. Not all the wires necessarily need to be connected. I rarely will connect the coin counter or coin lockout. 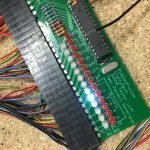 I used a Jamma tester and connected each wire to a cherry switch along with ground. 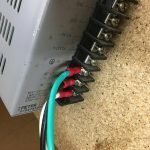 This gave me a quick way to know what wire connects to what button. The same method could be used with a DMM set on continuity and using a JAMMA pinout. Color of the wiring would also be helpful to figure out what wire goes with what button. I also made an easy free play that Bob Roberts recommended many years ago. You just simple run one of the credit wires to player 2 start button. That will if you hit the player 2 start button once, the game will coin up. Then you can hit the player 1 start and start a game. If you want a 2 player game, then just hit the player 2 start button an additional time. I chose this method because I didn’t want to hook up the coin door wires. Close up of the wiring to the switcher. 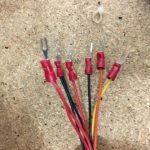 DC wiring with spade connectors. AC and DC wiring on a switcher. Jamma tester showing which button was pressed. Quick test for each button.